Its only the second week in February, but I’m already thinking about my Spring schedule! If my son makes the high school baseball team-its going to be an extremely busy season! I’ve already added all scheduled H.S. games and his travel team tournament schedule to a calendar, this doesn’t include his travel team regular game schedule, but it already looks full. Wow! What in the world have we gotten ourselves into? It won’t always involve us sitting at games for 3 hours because we won’t make most of his H.S. games due to work, but we do have to drive up to school to pick him up. I also have to keep track of his schedule because I know he won’t! My hubby isn’t good at keeping track of it either, so it all falls on me J Baseball schedules, dance, gymnastics, doctors, parties and anything else that arises must be put on a schedule! My daughter has also been saying that she has a dance competition in May. Not sure what that’s all about since the dance academy has not told me anything yet, but if it is true, another thing to add to our schedule-and hope it doesn’t conflict with the baseball schedule. If it does, I’ll be flying solo for the dance competition while hubby takes care of getting my son to his game on time. 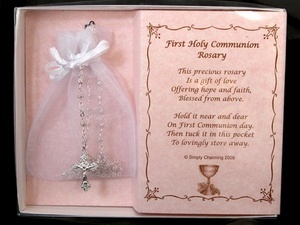 So far I know of one thing that will conflict with one of the tournament games-my daughter’s communion! There is no going our separate ways for this one-No Sir!! My son will be forced to miss this game because he cannot miss his sister’s Communion. 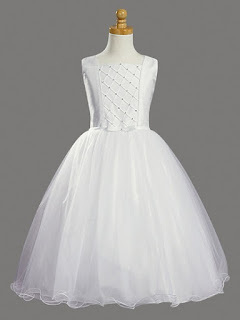 So besides arranging our Spring schedule, I am now starting to decide and plan for her Communion. Thanks to Pinterest, I have found some lovely dresses and accessories, but I’m not 100% sure I want to order that online. What if it doesn’t fit? What if its itchy? I’m hoping to make it out to some stores in the next few weeks to start looking around, maybe I’ll find something similar to what I have found online. There were 2 that I really liked! It won’t be a big event and it will mostly be family, especially since a couple friends will be at their son’s baseball games. So it will be a small gathering, hopefully at my uncle’s house if not it will be mine. One thing I am sure of is the cake! I will be ordering from the same Italian bakery I always order from…they are delicious!! The decorating is nothing out of this world, like those Cake Boss cakes, but they taste amazing….and that is what’s most important to me! The cake will accompany some Italian pastries, Cuban appetizers, sandwiches/wraps and chips(gotta mix things up a bit, lol). It’s a lunch, so I figured that ordering a tray of subs/wraps would be good. No cooking for me on this day! Now I also need to decide what to do about pictures! I took my son’s pictures and regret not taking him to a photographer. I’m thinking of calling up a locally known photographer for pricing-I’ve seen his work and it is beautiful! I’m just worried about the cost! Sears, Jcpenney and even Picture People have decent prices and specials-but I don’t feel like they have nice ‘Communion’ backdrops or props. So this is why I’m leaning towards a photographer and I just hope the cost isn’t crazy so it will make the decision easier. I also need to look for souveniors and the cake topper which I prefer them to be from Precious Moments! I LOVE their stuff! My wedding cake topper and both my kids’ baptism cake toppers were Precious Moments. For my son’s Communion I couldn’t find one, so I made one with a dollar store figurine-came out very cute, in my opinion! So since I have a few months to plan, I hope to find a precious moments figurine! I think that’s it for now! It’s a shame there isn’t any vacation planning involved, but hopefully that will come in a few months once baseball season is over!